If there is one thing outside of the beauty realm that I am head over heels obsessed with, it’s tea. Ask anyone from my office, but there isn’t a day (maybe even not an hour) when you’ll find me without a cup at my desk. I’ve got an entire cabinet in my kitchen devoted just to the goods, as well as most of the cabinet in my cubicle. What can I say, it’s basically my lifeblood. From a spicy chai, to an earthy oolong, to a fruity herbal, I’m definitely not picky when it comes to flavors, and am on a bit of a personal quest to try as many different teas as I can. 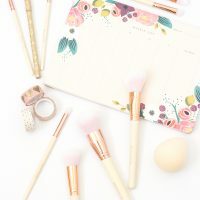 But (much like my obsession with makeup) being a tea enthusiast can get a little pricey, which usually means being extra selective about which ones I want to buy. Fortunately, DavidsTea rolled in to my local mall a couple of years ago, and they have THE BEST tea sampler sets. 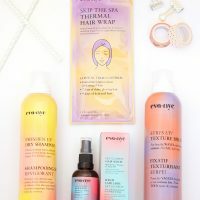 They’re constantly releasing new seasonal collections, and have a ton of different ways for you to sample multiple flavors without breaking the bank. 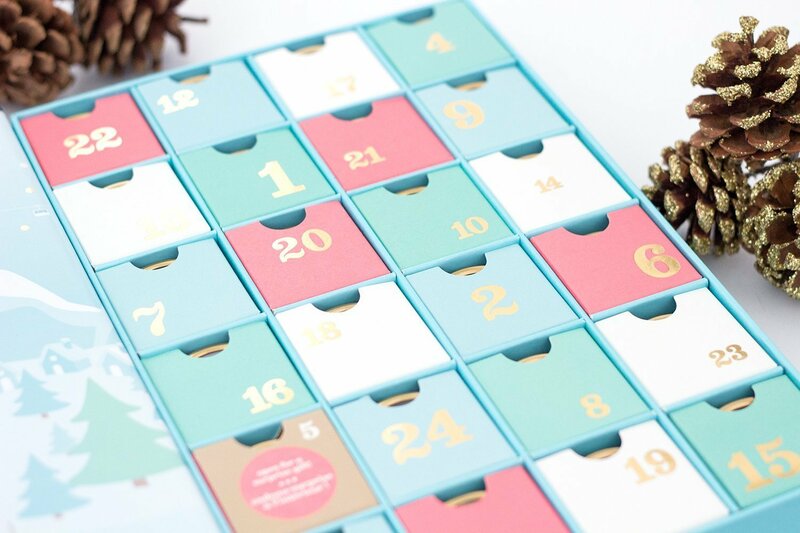 Perhaps the ultimate of all of these sets is the 24 Days of Tea advent calendar. I honestly can’t think of a better way to ring in the holidays than by getting to try a different tea every day (you know, without spending hundreds of dollars). Last year was the first time I picked one of these bad boys up, and I enjoyed it so much that I couldn’t help but put the beauty on pause for a day so I could share the 2016 version with you guys. Come take a look! So let’s start with some of the basics. 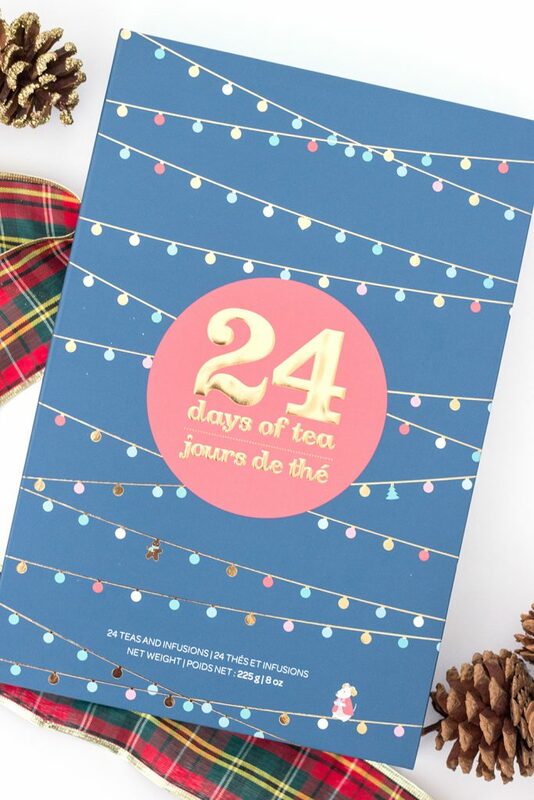 The DavidsTea 24 Days of Tea collection retails for $40. Inside are 24 different teas, individually packed in cute little tins, with a total weight of 8 oz of tea. Being the math nerd/bargain shopper that I am, I’m always curious to figure out the relative value of things I’m buying. In this set you’re ultimately paying $5 per ounce of loose leaf tea. When you look up the teas that are actually included in this set, the majority of them retail for $4.50 to $5.00 per ounce, with a few being a little more and a few a little less. The point? $40 may seem like a lot of money, but that’s about what the same amount of tea would cost if you were buying it directly from the wall. 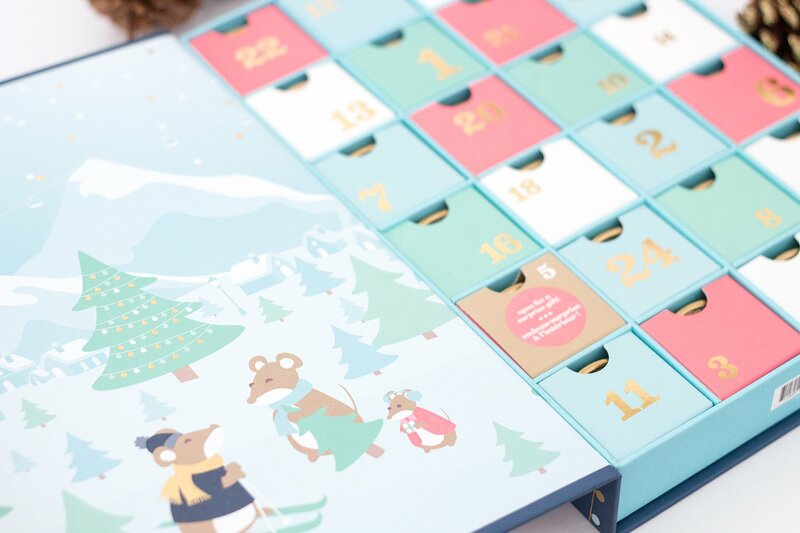 Plus you get the whole novelty of an advent calendar and the super cute packaging. If you don’t have a cup to ounce ratio already built into your noggin, each individual tin will make about 3 cups of tea, or 72 total (although it really varies depending on how strong you like to brew a single cup). Speaking of which, can we talk about the design of this calendar for a second? DavidsTea honestly always does an incredible job with packaging and presentation, and the 24 Days of Tea set is no exception. The illustrations are adorable, and the gold foil detail is a really nice touch. The construction of the cardboard is sturdy and durable, and the cover stays put with a very secure magnetic closure. Each tea is individually packaged in a gold metal tin, which is housed inside of a numbered cardboard box. Unlike advent calendars with perforated windows you need to tear open, this one is designed for continued use, so that you can try a tea without needing to finish the entire tin, and return to it another day. 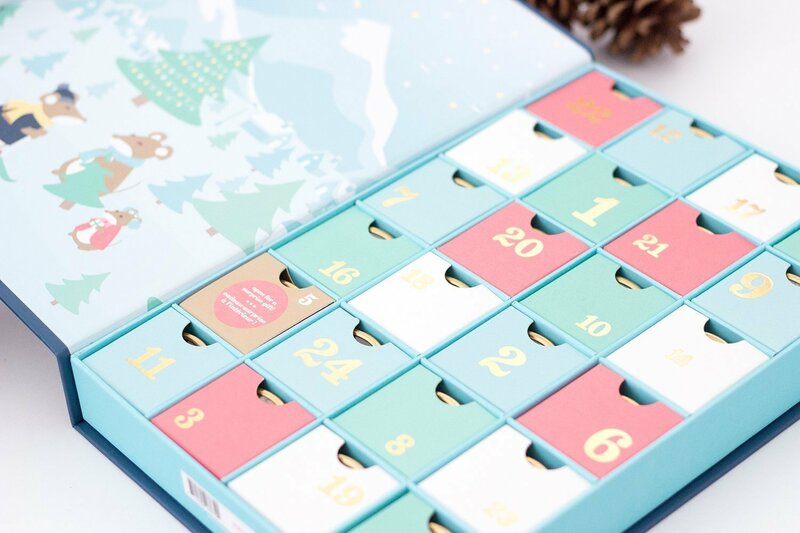 When you do finally finish a flavor, you can flip the box over to mark its empty, which will reveal a small piece of a larger picture the entire calendar spread eventually creates! This is a new feature from last year, where all the information regarding the tea name, type, and brew time were listed on the back. All that stuff is still on the box this year, but is on the bottom edge, instead. One of the things I was especially happy to discover is that there’s very little overlap between this year’s collection and the 2015 one. A few stand-out holiday teas make a reappearance, but for the most part you’ll find an exciting new collection of flavors to sample. So as not to spoil which tea appears on which day, I’ll list them alphabetically. This apple-packed blend tastes just like a hot cup of old-fashioned apple cider. Any bear would love this berry-packed blend with rosehips and blackcurrant. A rich, sweet blend of black tea, cardamom, cane sugar and cinnamon. With sweet cocoa and almonds, this rich black tea tastes just like the classic treat. A decadent oolong with toasted coconut, white chocolate and cane sugar. This sweet, fragrant black tea blend has all the aroma of a fresh baked coffee cake. This sweet, dessert-like rooibos blend has real pieces of caramel. This traditional Japanese blend combines sencha with roasted rice. An irresistibly comforting blend of sweet pear and warming ginger. An all-natural, super refreshing blend of green tea, pineapple and passion fruit. A rich and fudgy blend of pu’erh, black tea, cocoa nibs and chocolate. A rich, full-bodied black tea with notes of dark honey. This rich yerba mate blend has coffee beans, cocoa nibs and white chocolate. A light, delicate chai with green tea and exotic spices. With fruit, nuts and spices, this warming oolong is a comforting holiday treat. A special holiday blend of Chinese black tea, peppermint leaves and spices – all sprinkled with real little candy canes. This soothing blend of lavender, strawberry and hibiscus is a one-way ticket to your happy place. This sweet, tart and earthy herbal is as nice and rosy as a caroler’s cheeks. This all natural chocolate-mint tisane is the perfect way to warm up on a chilly winter day. A sweet and spicy blend of apple, figs, cinnamon and star anise. This rich, tangy blend combines rhubarb, strawberry and yogurt pieces. This sweet and subtle organic green tea is a tasty treat you can feel good about drinking. In total you get 8 herbal teas, 5 black, 4 green, 2 oolong, 2 pu’erh, a maté, a rooibos, and a single white tea. From fruity, to spicy, to minty and earthy, there’s basically a little bit of something for everyone. There’s also a nice balance between caffeinated and caffeine-free options. And, since each tin has enough tea for multiple cups, it’s perfect for sharing with your fellow tea lovers! Last year after the Christmas season was over I still had a lot of my tea from this calendar left, and found it to be a pretty popular offering to my friends when they came to visit. Long story short, if you’ve ever been curious about trying loose leaf tea, this set is a must-have. It also would make a great early Christmas present to a tea lover in your life! If you don’t have an infuser at home, you can pick up a box of these filter bags to brew your tea with ease. I personally love keeping these on hand at work, where its much harder for me to bother with cleaning out a metal strainer. Every year this calendar goes fast, so I would recommend jumping on it sooner rather than later! Let me know in the comments down below if you plan on picking one up. Are you a tea lover? What kind is your favorite?